Landscape lighting is the best way to enhance your outdoor space and recreate it as a living space. With a range of designs and features, you can choose the right landscape lighting to suit your needs. Whether you are looking to add a focal point to your garden or increase the security around your property. With our team of highly experienced and qualified electricians, we deliver your visions of the perfect outside living. We work with you to ensure we understand your project, offering advice on the latest developments in landscape lighting. Our electricians support you from design to installation, maintenance and repairs. We complete projects in a timely manner, allowing you to enjoy your garden as soon as possible. Pathway Lighting – Compact low-level lighting along the walkways allow you to safely enjoy your garden at night. Patio Lighting – With a range of designs and cost-efficient options, you can create the perfect atmosphere for alfresco dining. 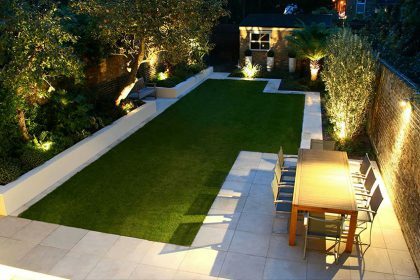 Deck Lighting – No matter what foundations you have in your garden, we can install the right lighting to suit the landscape. Spotlights – You can highlight the beautiful features of your garden or simply illuminate the back entrance to your property. We can install spotlights on timers or motion sensors to give you the best solutions for security and convenience. LEDs are often used for spotlights due to their versatility and efficiency. Why not upgrade to LED Lighting today. Flood Lighting – Perhaps you have a large outdoor space you want to illuminate. You can light up the garden party, make the swimming pool visible or increase the security of your property. Ground lighting – Ground lights are robust and work with any landscape features. They give a modern feel, improving the overall aesthetics and security of your garden. Post Lights – With a range of decorative, practical and cost-efficient options, you can make your outdoor lighting as much of a feature as the garden itself. Pool Lighting – It’s nice to be able to enjoy your swimming pool at any time of the day. Whether you are looking for discreet underwater lighting or lighting that surrounds the pool, we can work with new and existing installations.